A few weeks ago I posted a picture of some work I had done for my vegetable garden. After spending some time watching the sun I realized that the spot remained in the shade for most of the morning and than again in the late afternoon. So I gave up for a week and helped D haul stones from up the hill in the back of the house down to the street for his landscaping project. 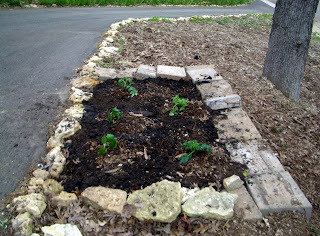 This week we decided to clean up the area near the driveway and use that as my garden. 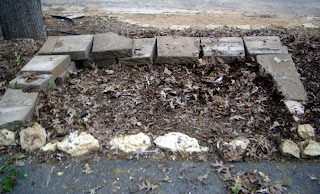 We used leftover paving stones from the project two summers ago. 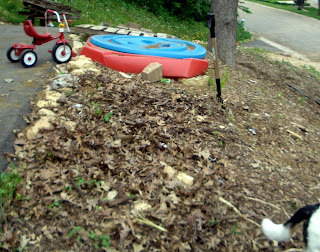 Most of the hill is mulched trees from when we built the house 3 years ago. I threw in some sand from the sandbox and half a bag of dirt that I had. The area is so rocky in part because of the gravel that got pushed halfway down the hill from the blacktop job and the rest is just nature. 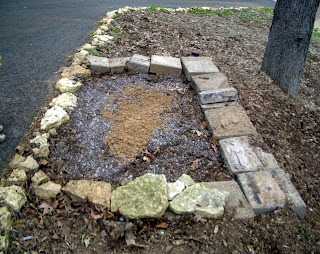 After searching the property for better dirt and even taking the wheelbarrow into the woods in search of dirt I surrendered and bought 8 bags of topsoil and two bags of fertilized dirt in which I surrounded my first 5 plants. Here's my favorite tomato plant. Grow baby grow! Saw today that you began to follow my blog, and thought I'd stop by to say hi. Your garden is lovely. Sadly I have a black thumb and cannot grow a thing, but in having one I admire those who can grow things, that much more.